I don't provide web-design service on regular basis, but i might accept a request about just PSD design without writting markup. All these old projects were personal favours or exceptional cases. This gallery is just a showcase of works i've designed since 2005. You may NOT use these previews for any purpose - the designs have their owners already. 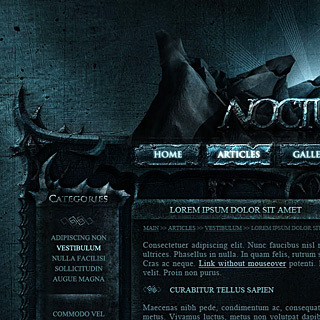 Dark Gothic Web-Design with bright blue magic elements. 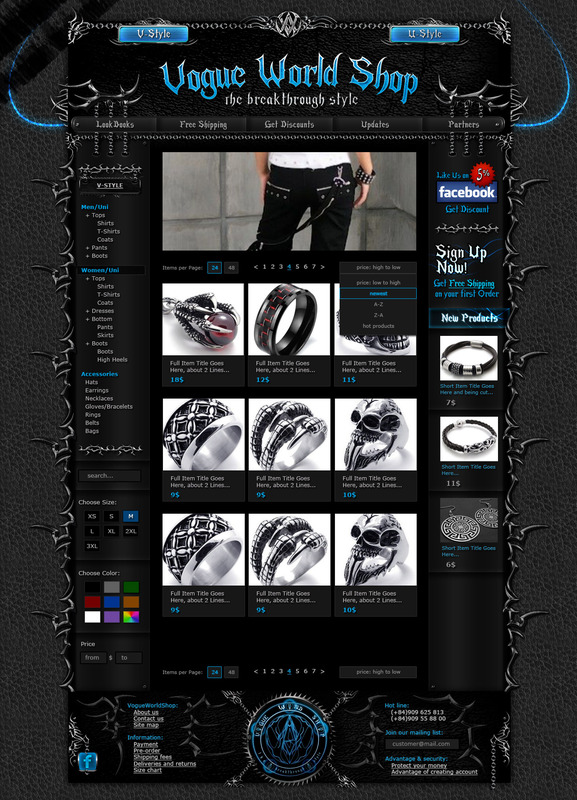 Designed for Gothic, Punk, Metalhead clothing and accessories store, so includes all product pages, product list, info page, dropdown menus, main page with campaigns. 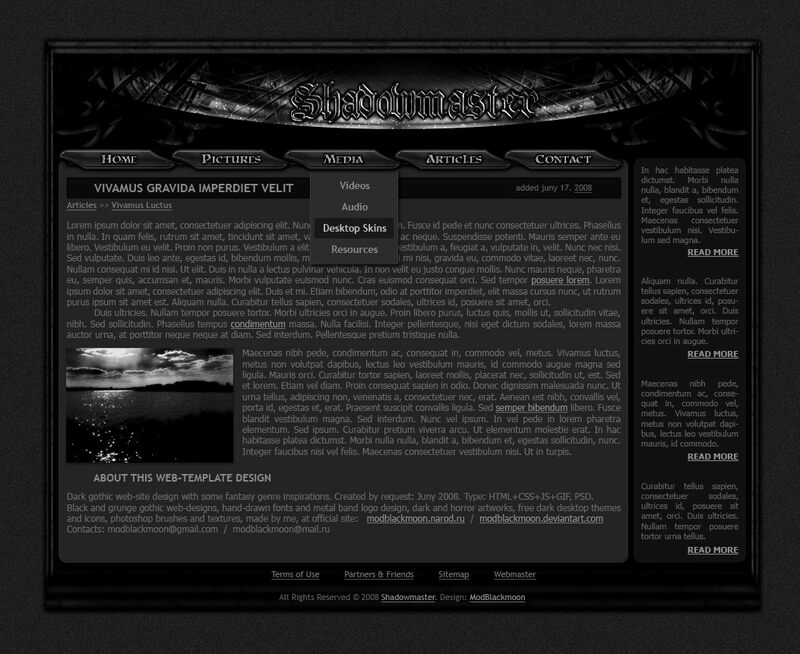 Dark gray web-template for Dark Side Music. Overall design looks like an abandoned city with a graveyard and walking skeletons, skulls with acid eyes, Zombie holding facebook icon. 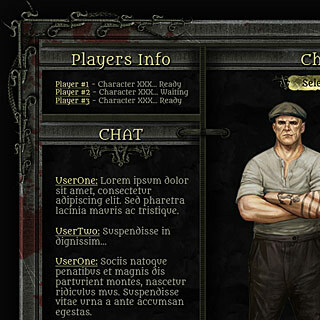 Game Interface Design. Lobby window. 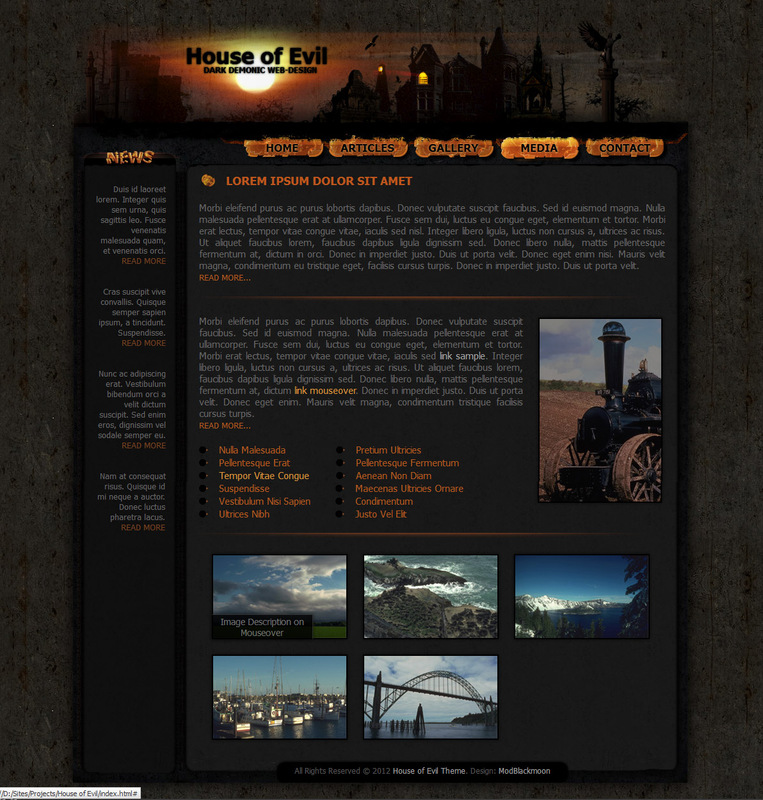 A mix of horror and steampunk styles. 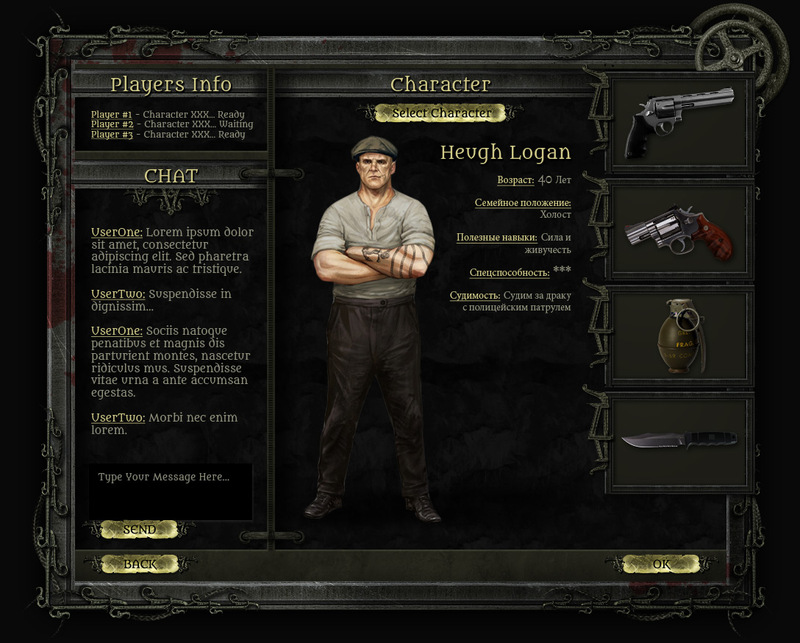 Character and inventory items are placeholders as it was planned to use 3D. 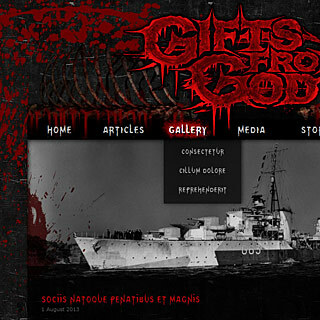 Metal Band website Design for Roman Romanow and his 'Gifts from God'. 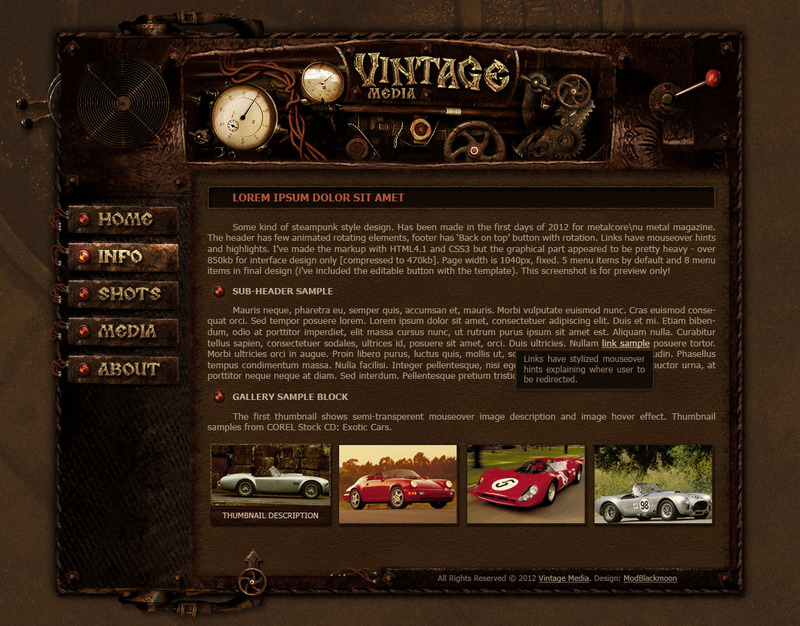 Includes gallery, articles, news, social icons, dropdown menus. 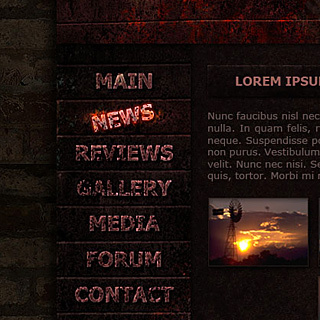 Designed as black panel on grunge background with blood splatters and bones. Hi-tech military style with panels and wires has been created for International Security Group, managed by my good friend. 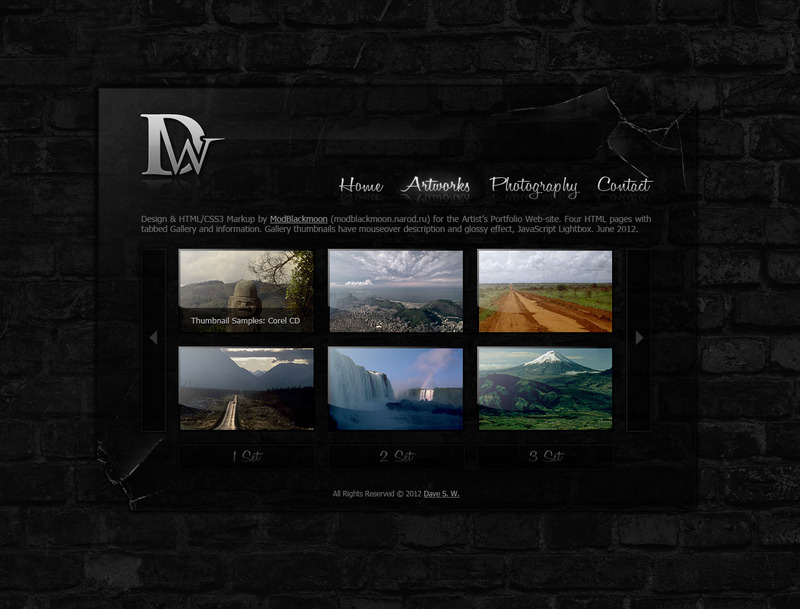 Includes dropdown menus, gallery, services block with additional button widget, intro block. Simple nice and clean web-design for Android Apps Developers. 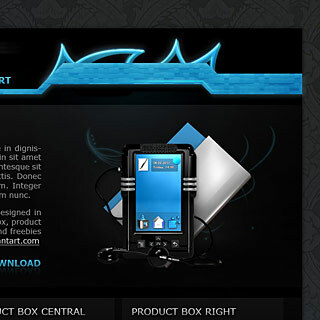 Limited to 4-5 main menu items, featured box and product boxes with icons and descriptions. 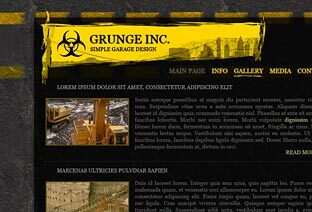 Dark Industrial, Sci-Fi web-template Design with grunge textures, steel pipes, sparkles, wires and lots of other advanced graphics. 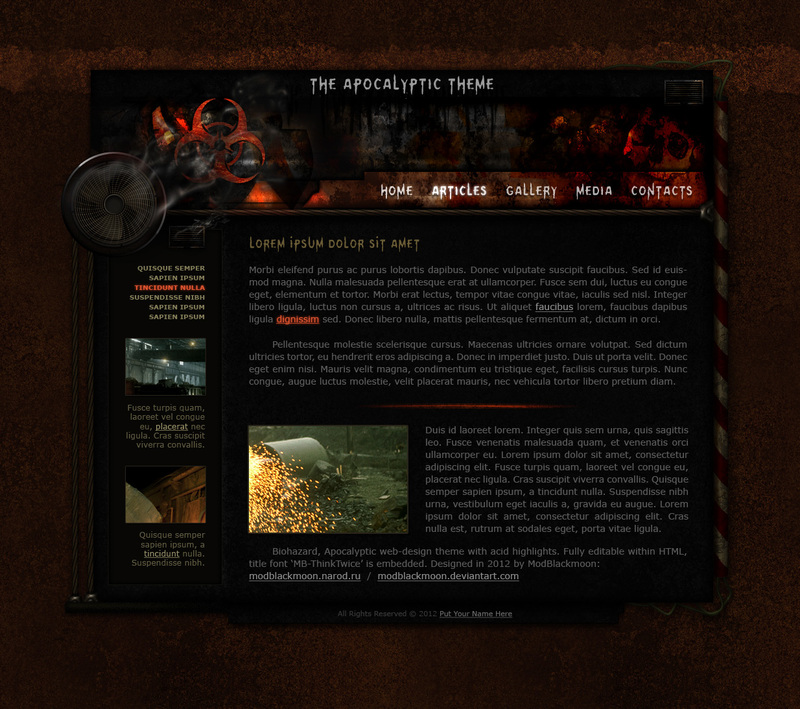 Includes styled news sidebar, article elements, gallery, login panel, social icons hanging on chains and horizontal main menu. Unique, all handmade PSD design. Contact me if you're interested. 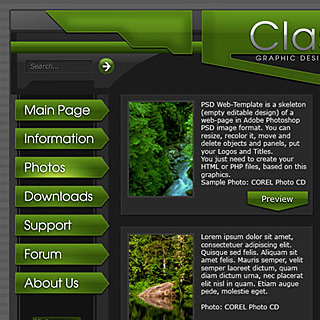 HTML+CSS Web-Template for Sale to a single user. Price 50$. 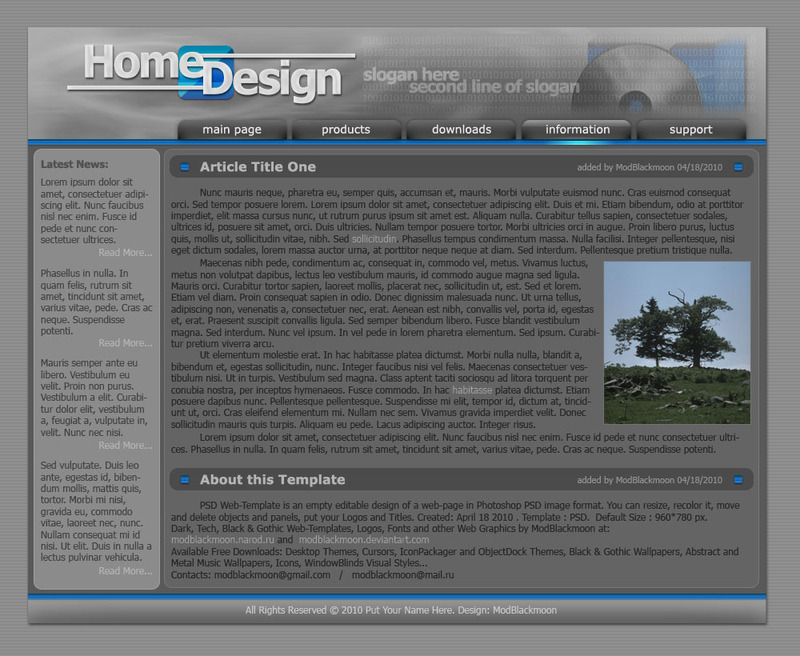 5 pre-made pages with styled article elements. Dark Grunge Industrial style with bright yellow elements. 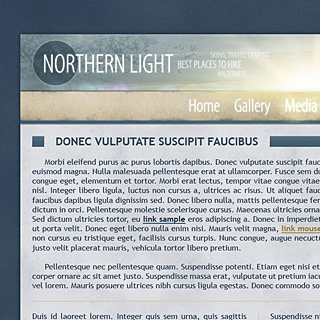 Fully editable within HTML, no PSD needed to replace texts. 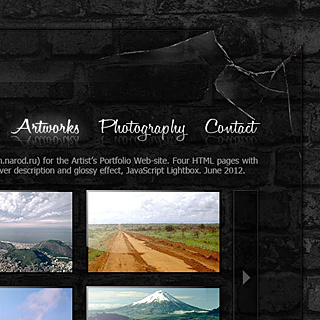 Animated header icon, menu mouseovers, facebook icon, gallery mouseovers. Tested in Firefox, chrome, Opera. Works correct in IE7, but without animation. 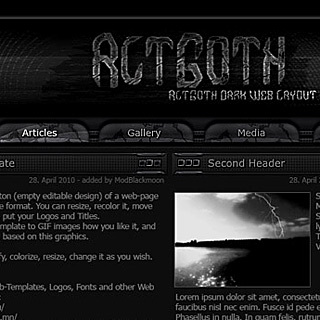 Dark aesthetic grey web-design with gothic ghostly feel. 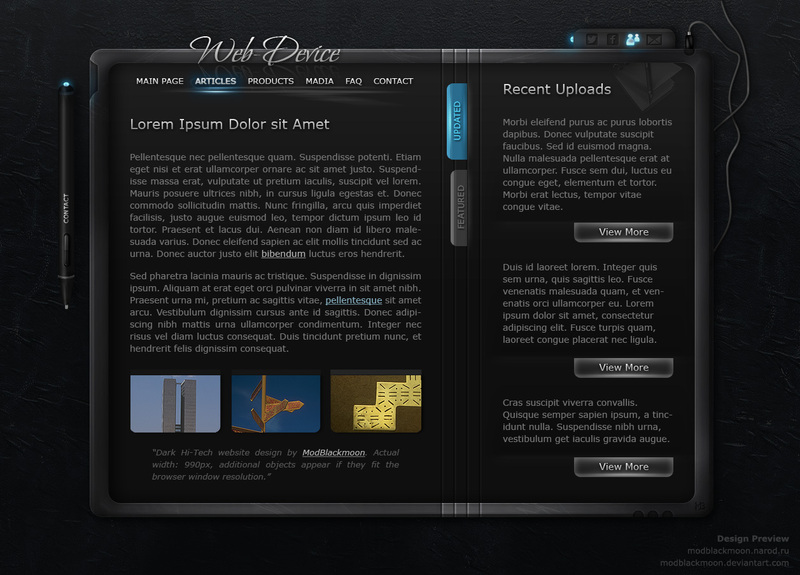 Four menu items, social icons, sidebar with an image box and description. 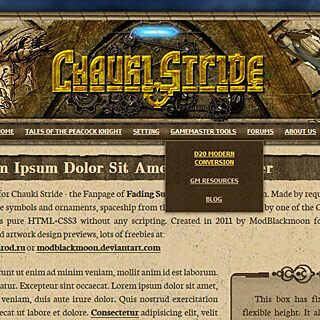 Website design for Chauki Stride - the Fanpage of Fading Suns game by Holistic Design. Made by Brandon's request partially using the original in-game symbols and ornaments, spaceship from the right has been provided by one of the Chauki Stride team members. 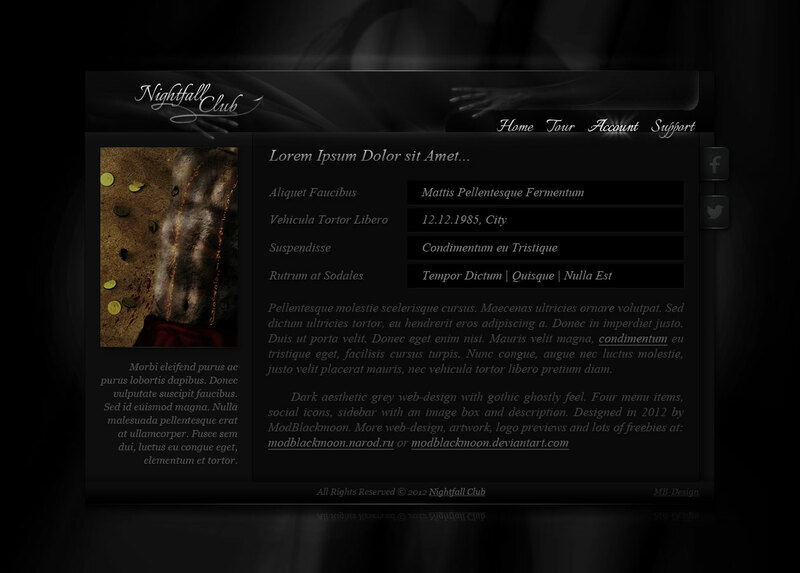 Coded as pure HTML+CSS3 without any scripting. 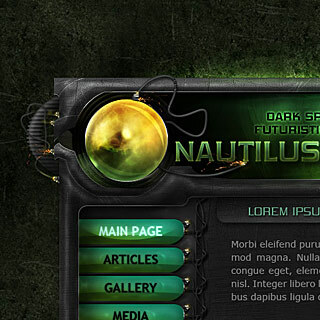 Futuristic, Sci-Fi web-template design with glowing orb, wires and sparkles. 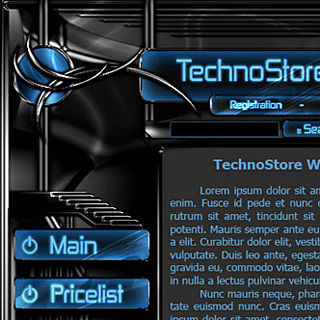 Styled as space ship panel with left vertical menu. 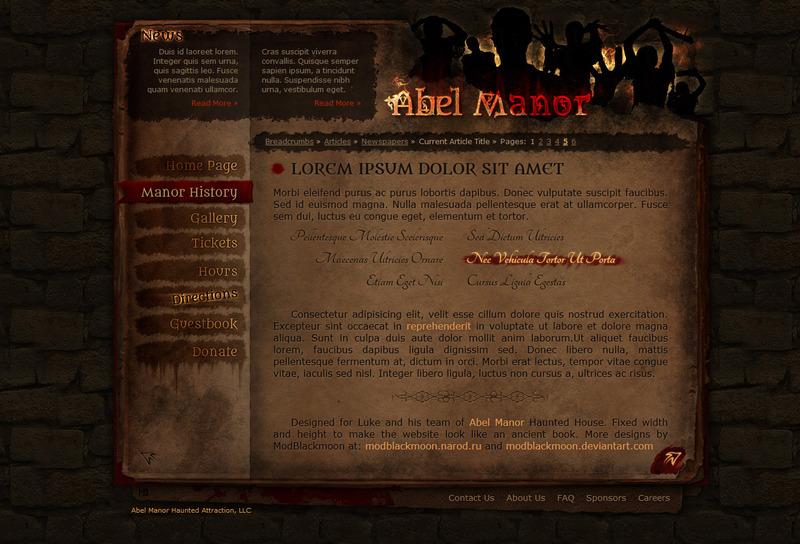 Designed for Luke and his Team of Abel Manor Haunted House Attraction. 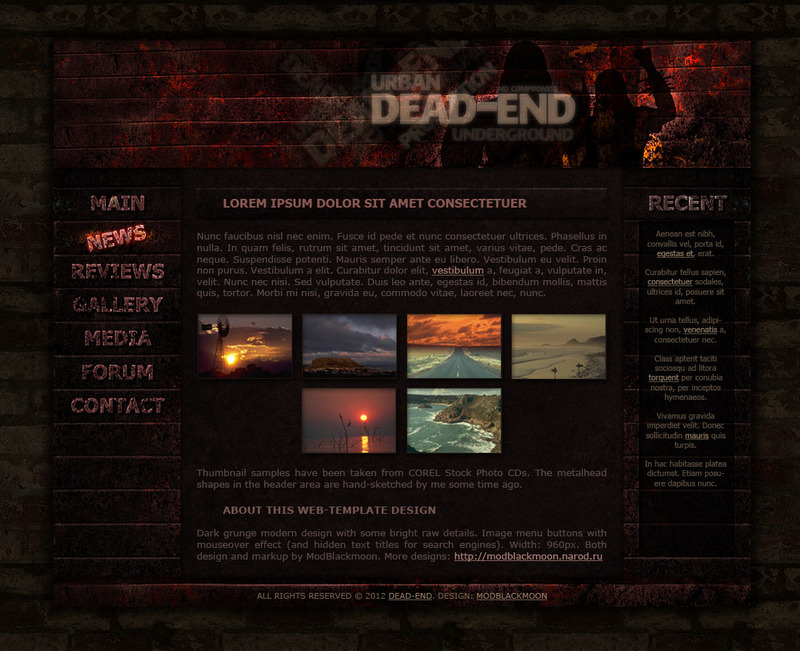 Animated gallery mouseovers, fading light animation of header. Markup has fixed width and height to make it feel more like real book. 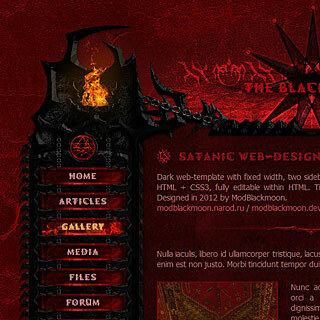 Dark red, infernal HTML+CSS3 web-design with satanic fire chalices, gothic, vampiric black ornaments and sigils. Menu and gallery with animated mouseovers. 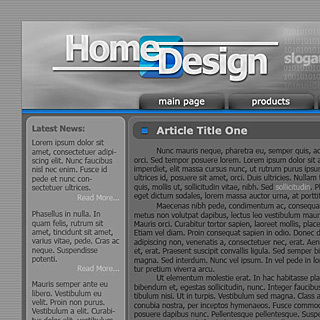 Fully editable within HTML. Sold, for Preview only! 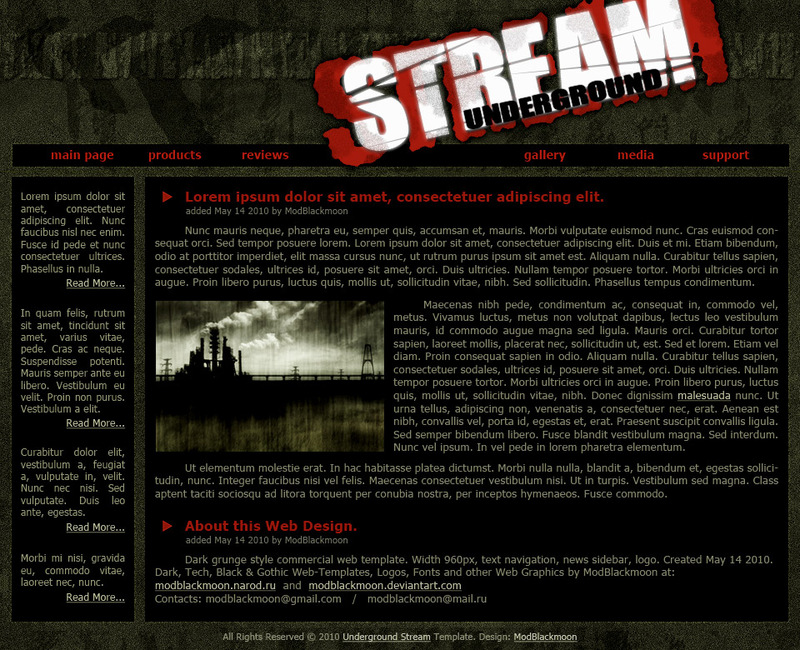 Dark, industrial web-design with post-apocalyptic atmosphere and grunge dirty look. 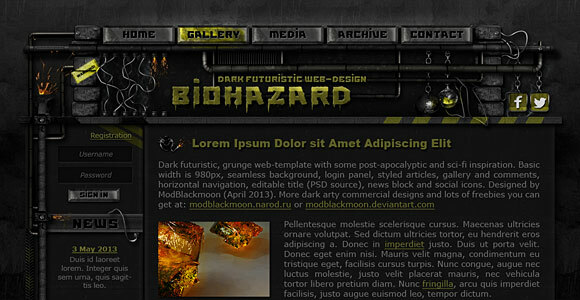 Bright acid biohazard icon on the dark rusted plate, burnt fans, smoke and embedded leaking fonts. 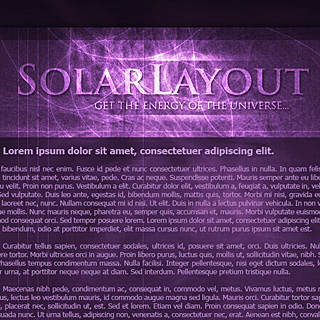 Dark Hi-Tech futuristic web-design. The interface looks like Tablet laying on the table with stylus,wires and highlighted buttons. 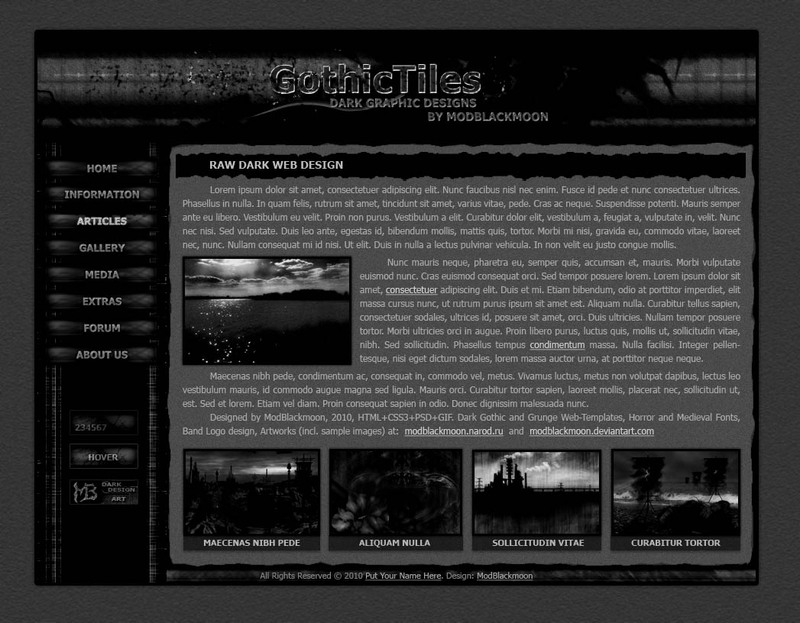 Dark grunge, demonic web-template with some gothic or dark fantasy atmosphere. SEO friendly, HTML+CSS. 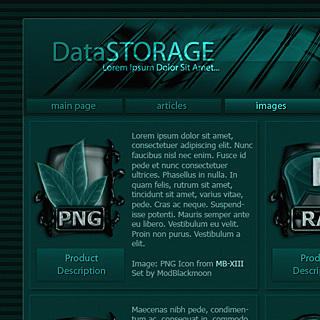 Fully editable text, transperent image descriptions on mouseover. Date: August 2012. Designed just for fun, contact me if you're interested. Subtle winter theme with sunrise or sundown in the snowy wood. Nice minimal design for Traveling and Skiing Guide. 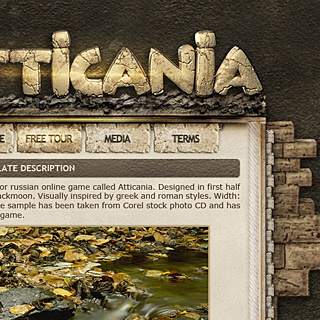 Russian online Game Interface design with some Greek Roman inspiration mixed with subtle grunge textures. User panels placed on bricks. 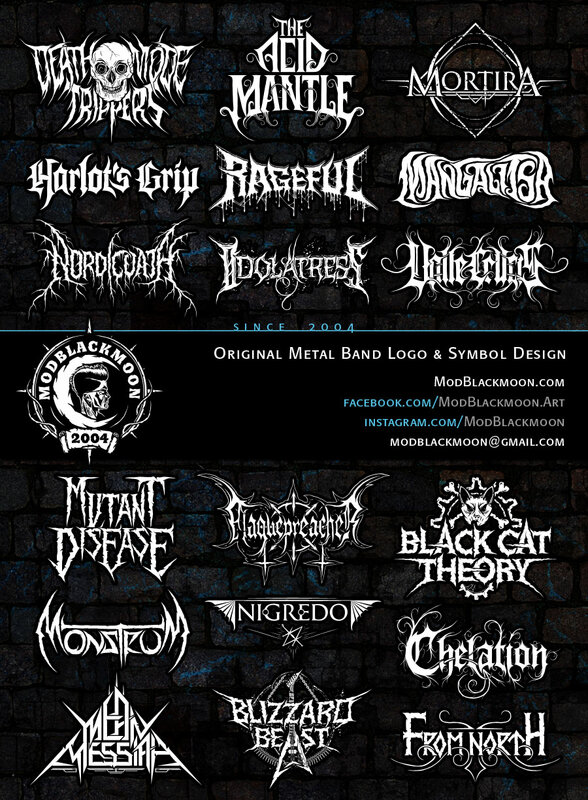 Dark grunge artist's portfolio design. 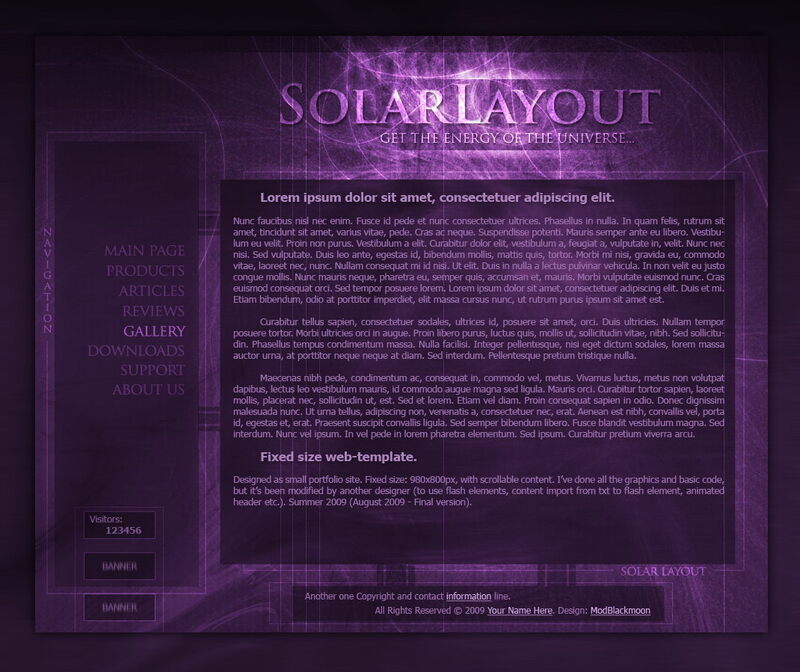 Clean plastic panel with cracks and minimalistic horizontal menu with mouseover effect. The black brick wall works as a seamless background. 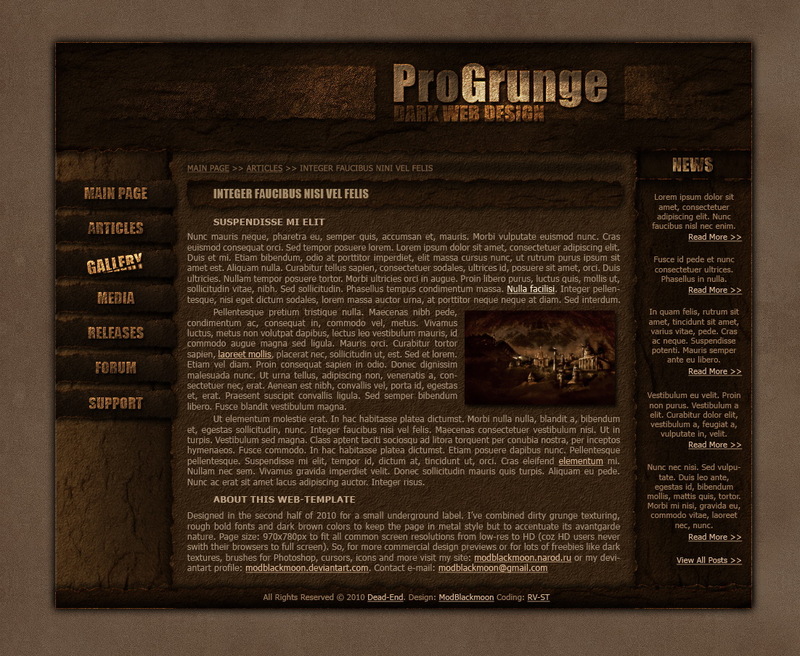 Dark grunge, punk style web-design with some raw bright elements and menu with cool mouseover effects. Fixed Width: 980 px. 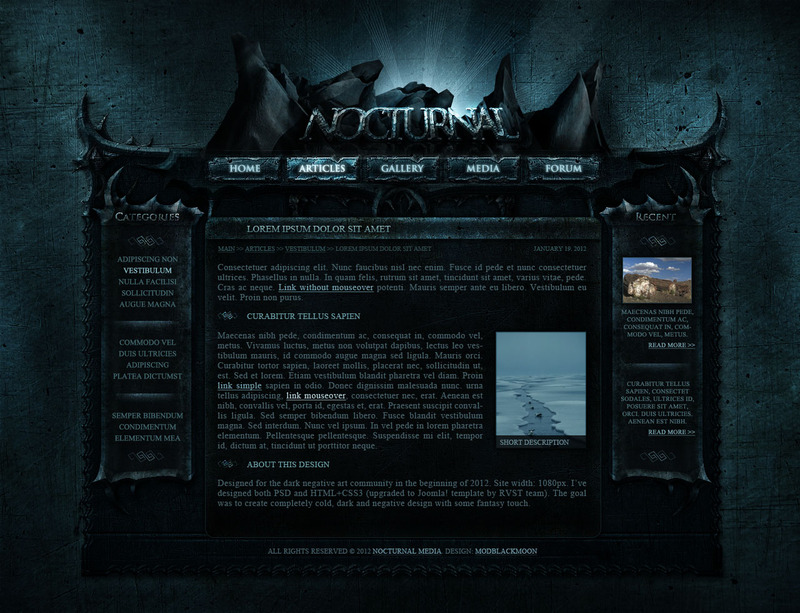 The goal was to create dark, cold, atmospheric and evil web-design, but avoiding those typical gothic elements. I've done both design and HTML CSS markup. Fixed Width: 980 px. 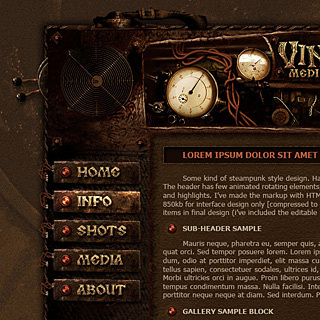 Steampunk, grunge web-design with lots of wires, mechanics, cogs, toggles, meters, gears. Looks like some dwarven machine. 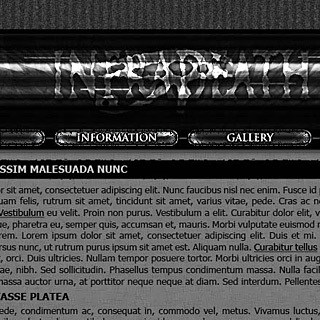 I've made both design and HTML CSS markup for metalcore & nu metal magazine. Fixed Width: 1040 px. 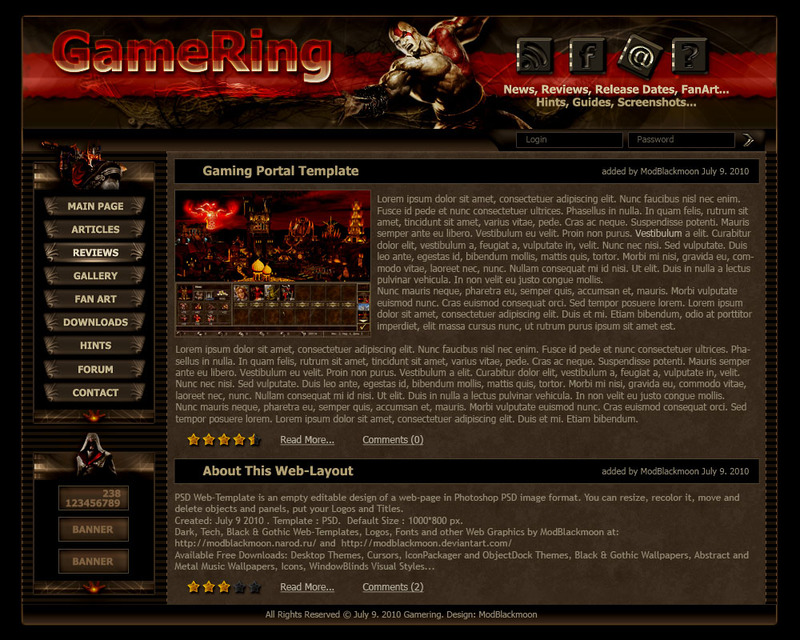 Designed for online gaming portal. Was meant to be used for games such as Lineage II and Warcraft. 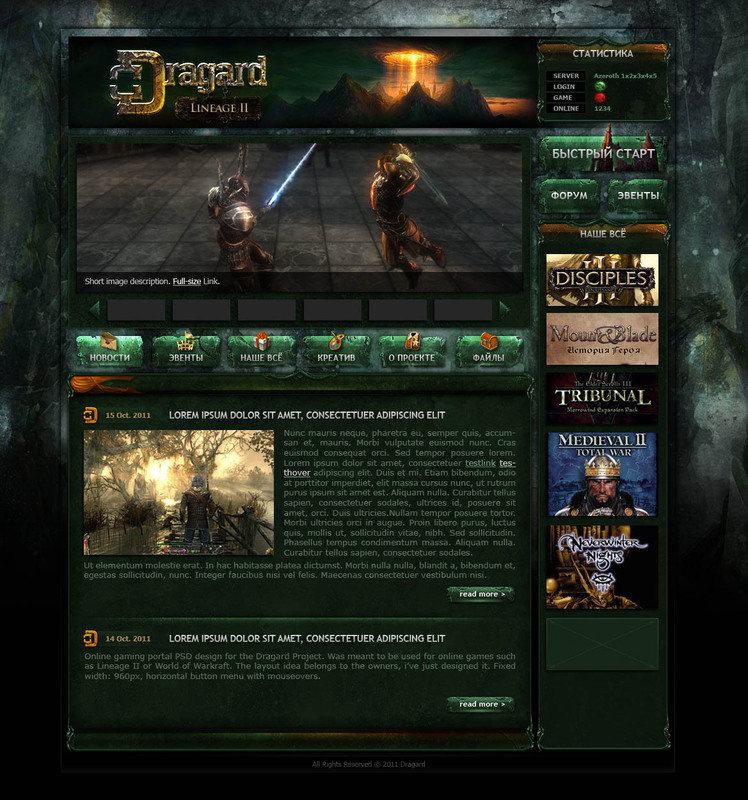 The layout idea and game illustration choice by site owners. Designed for free as promotional PSD template for social network community. 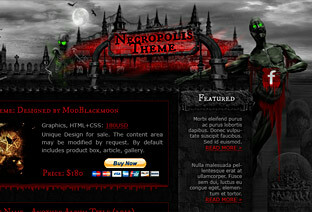 Dark gothic, vampiric design with black roses and bloody red elements. Fixed Width: 960 px. PSD only. Dark grunge style with bright torn elements. 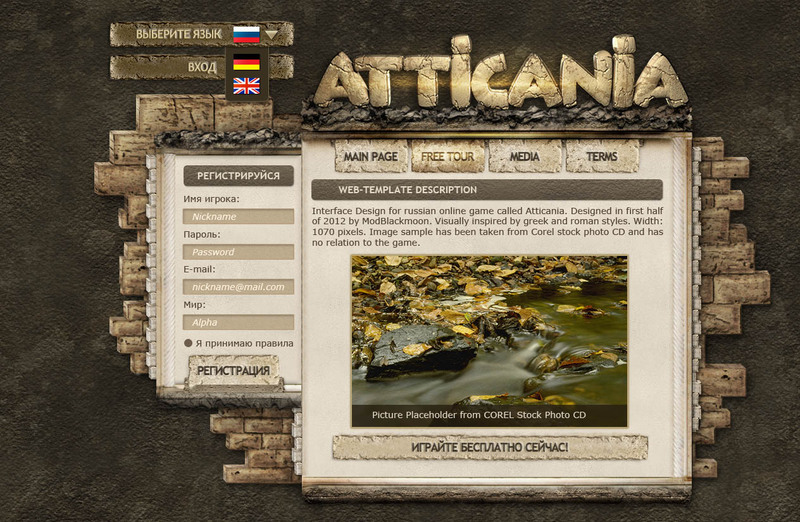 Web layout with vertical menu with mouseover effects (shown on the screenshot). Fixed Width: 970 px. 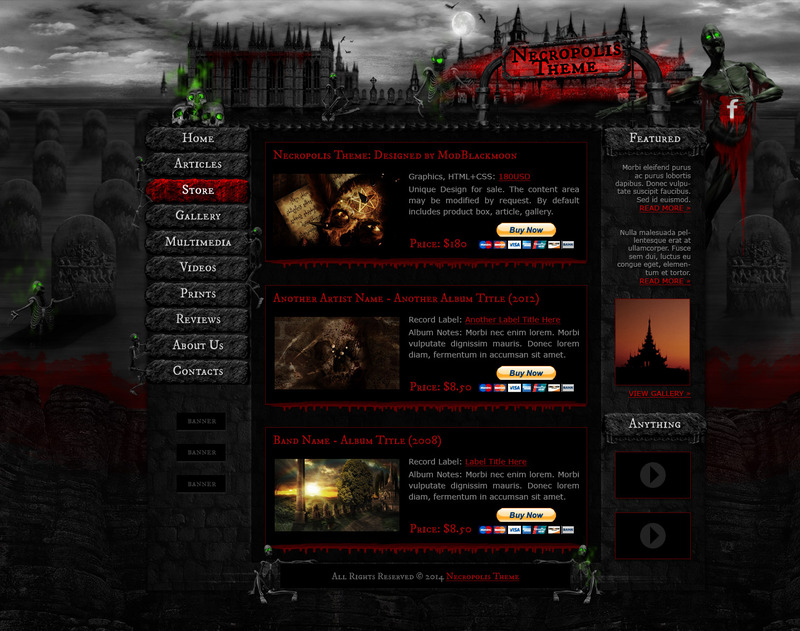 Dark gothic style web site design with horizontal menu with mouseover effects. I've added some fantasy breath to make it less metalhead type. Fixed Width: 960 px. 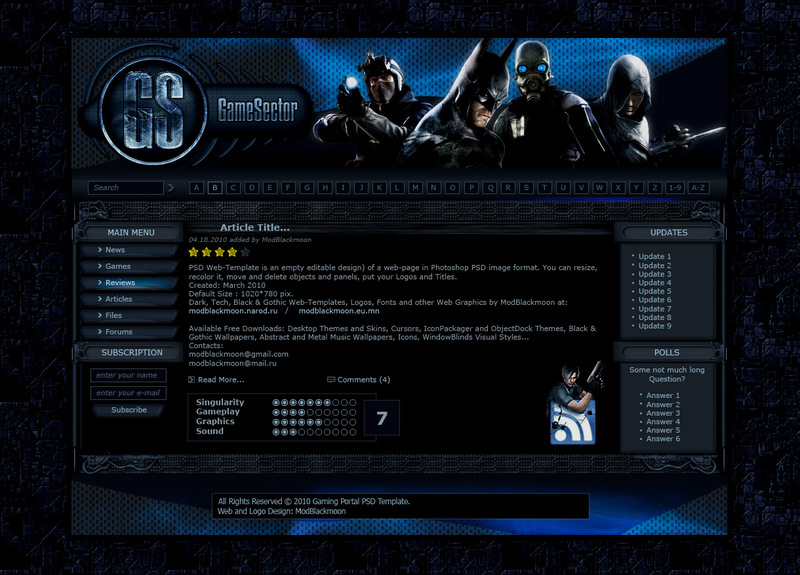 CSS was upgraded in 2010. 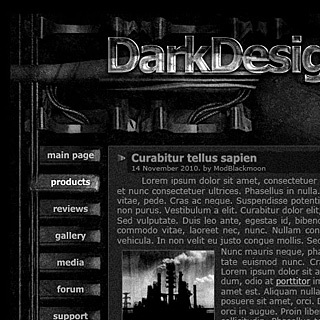 Dark webpage design with vertical navigation menu with mouseover effects. 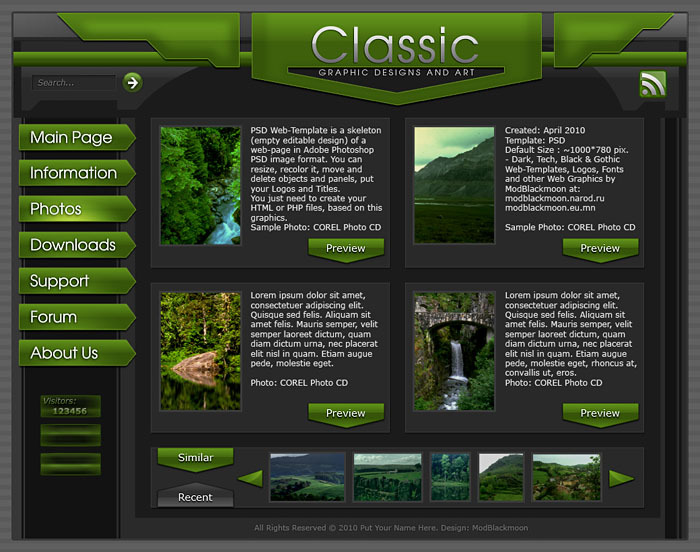 Designed for multimedia gallery. Fixed Width: 960 pix. 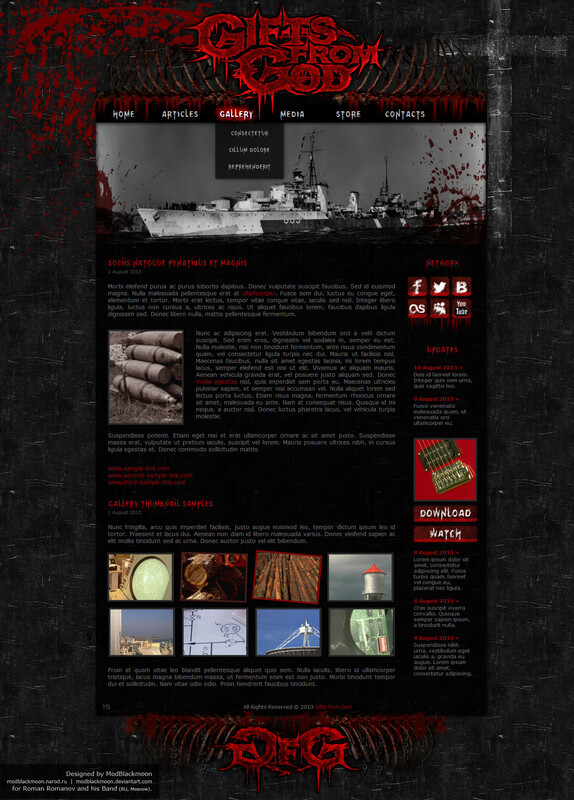 Raw and dark site graphic design. Negative colors and noisy textures with torn shapes. Horizontal menu buttons with text, right sidebar with categories list. Fixed Width: 960 pix. 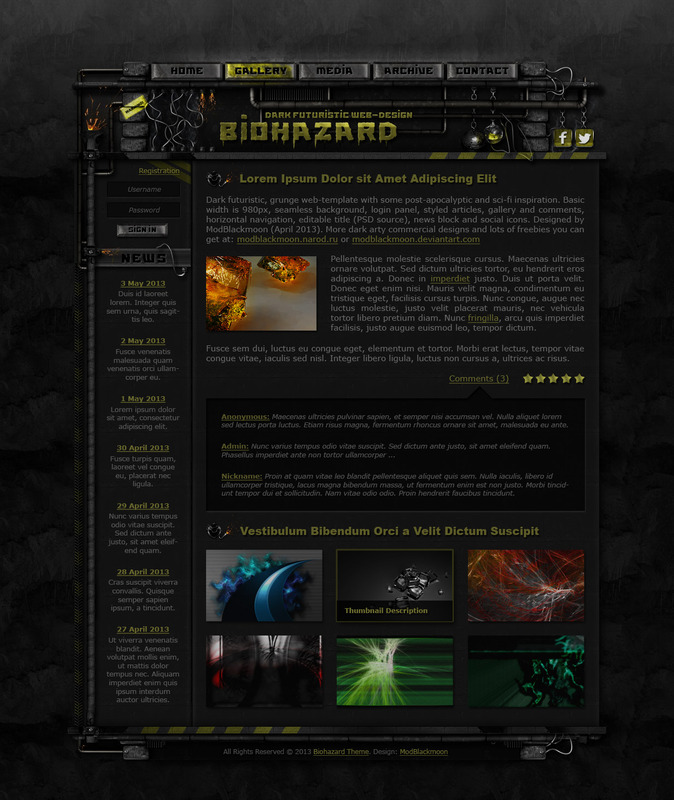 Futuristic dark site design. Black plastic panels with chrome elements and bright blue hi-tech screens with the content. 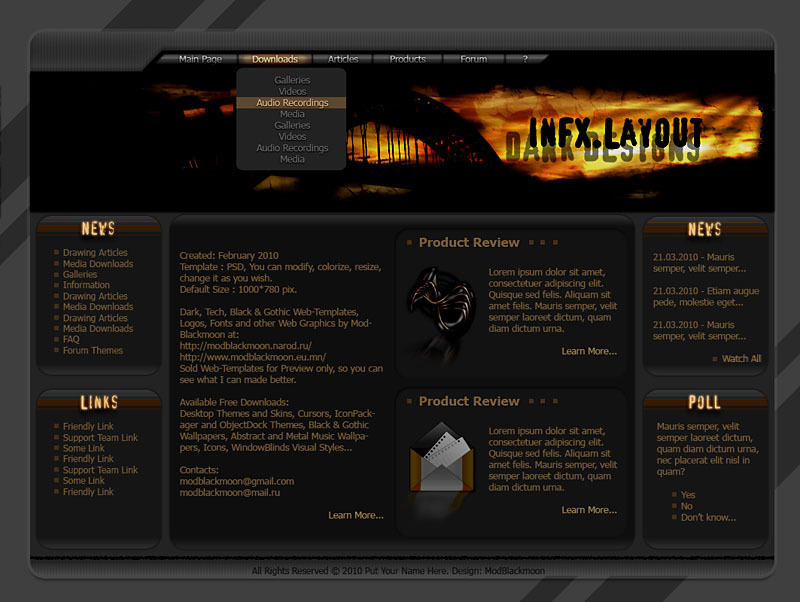 Header with login and search panels, right vertical menu with banners area, left news section. Fixed Width: 960 pix. 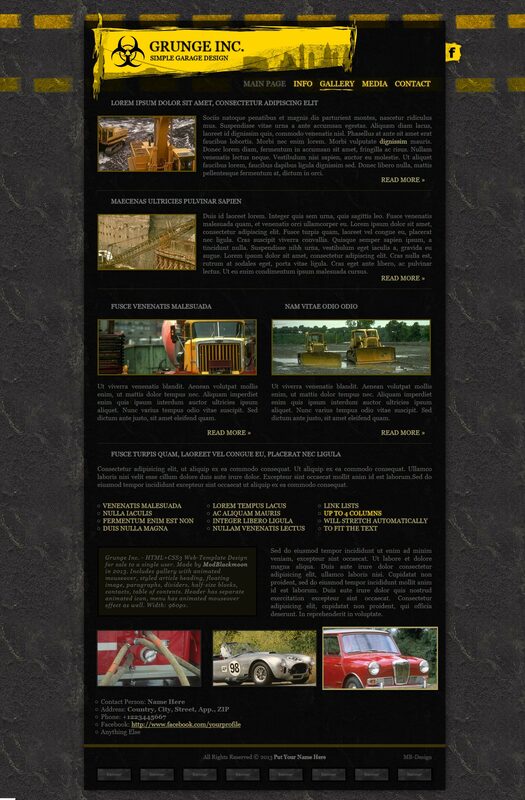 One of the most interesting site designs i've ever made. 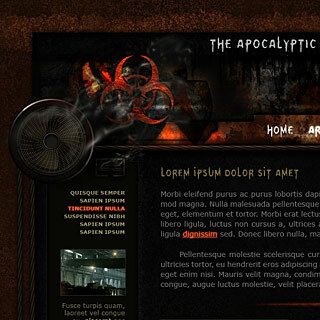 Dark Gothic colors and raw grunge style with hi-tech panels, wires and mechanisms make it looks like 3d site design. Vertical buttons with text navigation menu with button moving effect on mouseover. Fixed Width: 960 pix. Dark raw grunge style. One more online store design. Horizontal text menu, left sidebar with news. Stylized content column. Sample image came from my artwork gallery. Fixed Width: 960 pix. Attempt to mix the raw grunge style with dark and aesthetic gothic:). Designed for photographer's portfolio. 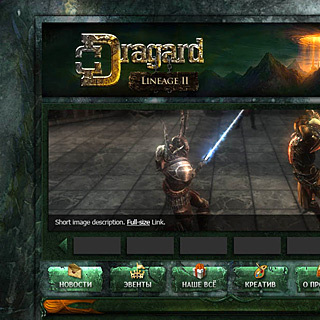 Left image menu. Stylized content column. Sample gallery images are from my artwork gallery. Fixed Width: 960 pix. 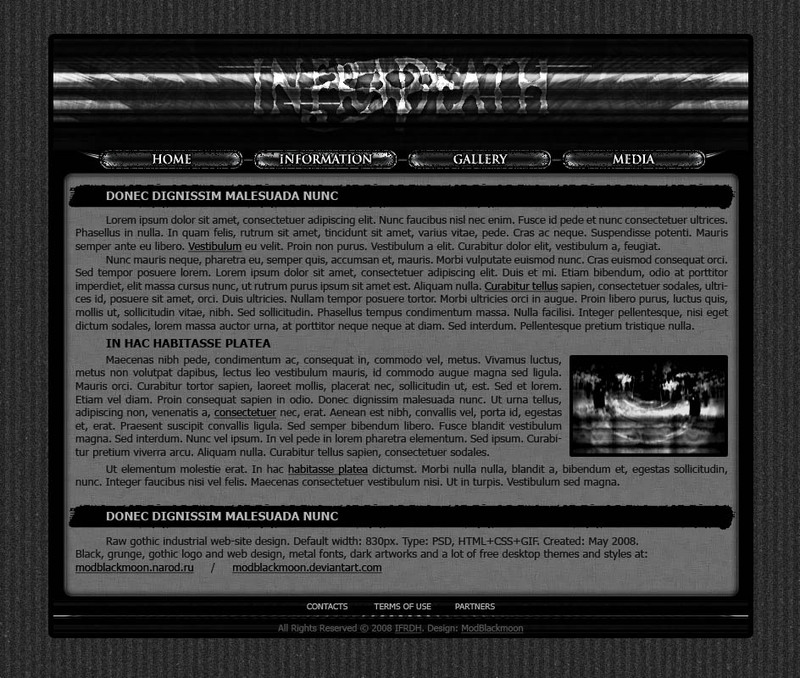 Dark techno style web-template design. It was made for a friendly online store. Sidebars with categories, item sorting and user panel. Stylized content column with item description blocks. Fixed Width: 960 pix. 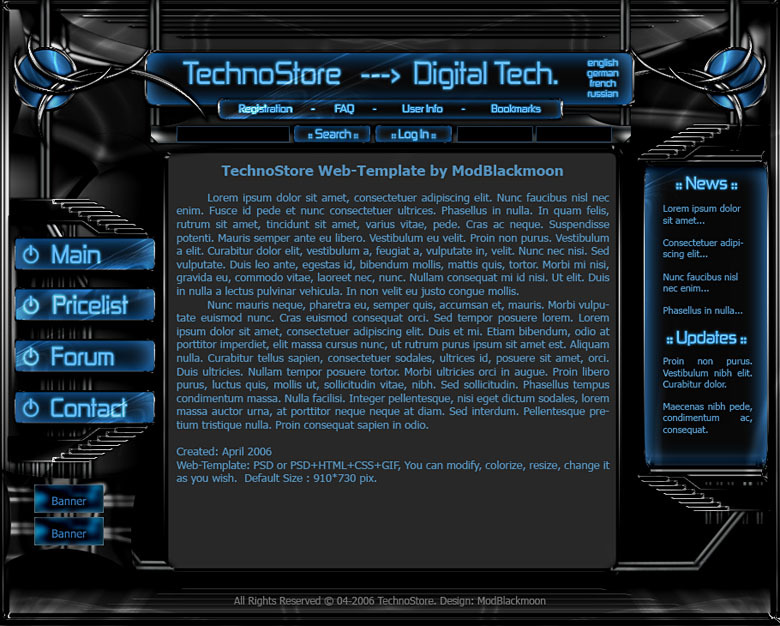 Dark Techno Style web-template design with bright blue neon elements. 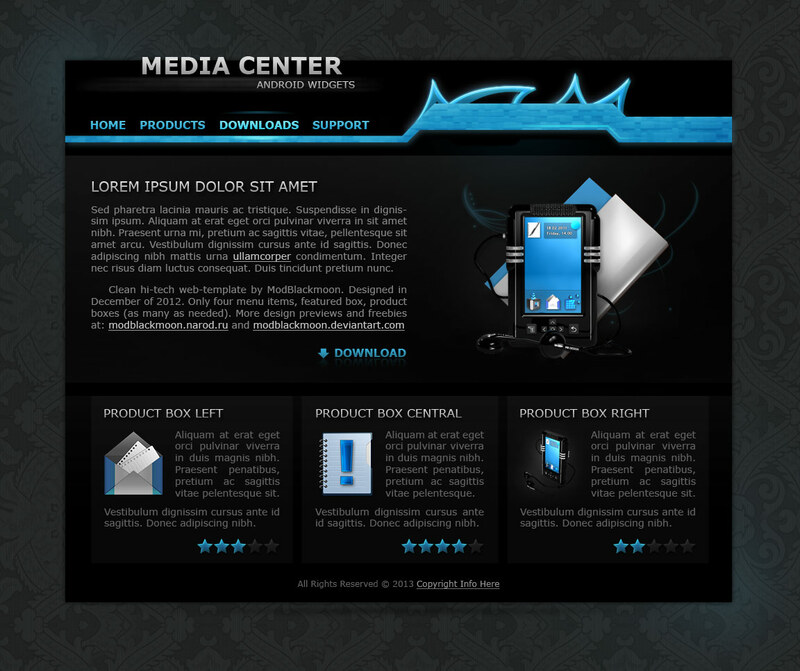 Designed for Audio & Video Online Store. 3 Columns with 2 Sidebars with categories and news. Content column built of containers with products. 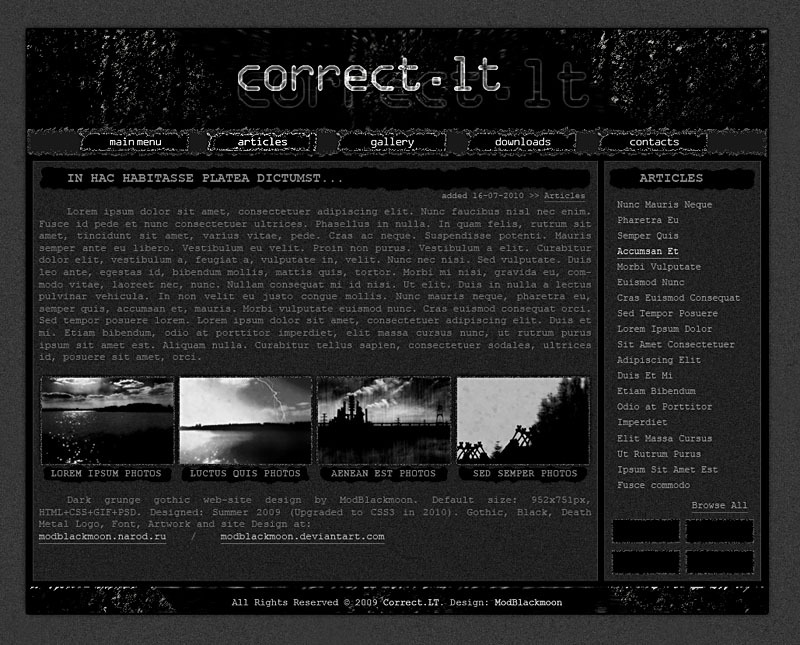 Top menu with mouseover effects. Icons: my MB-eNeon set. Brown and red bright game reviews portal design. 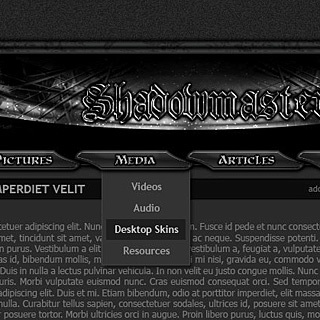 Left sidebar with ornate buttons with highlights on mouseover [Game Characteds: Overlord II, Assassin's Creed]. 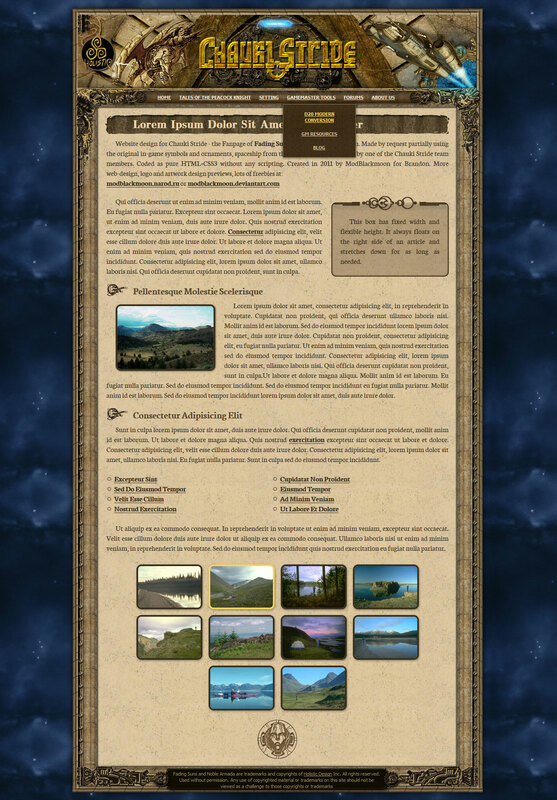 Styled content column [Screenshot: HoMM 3]. 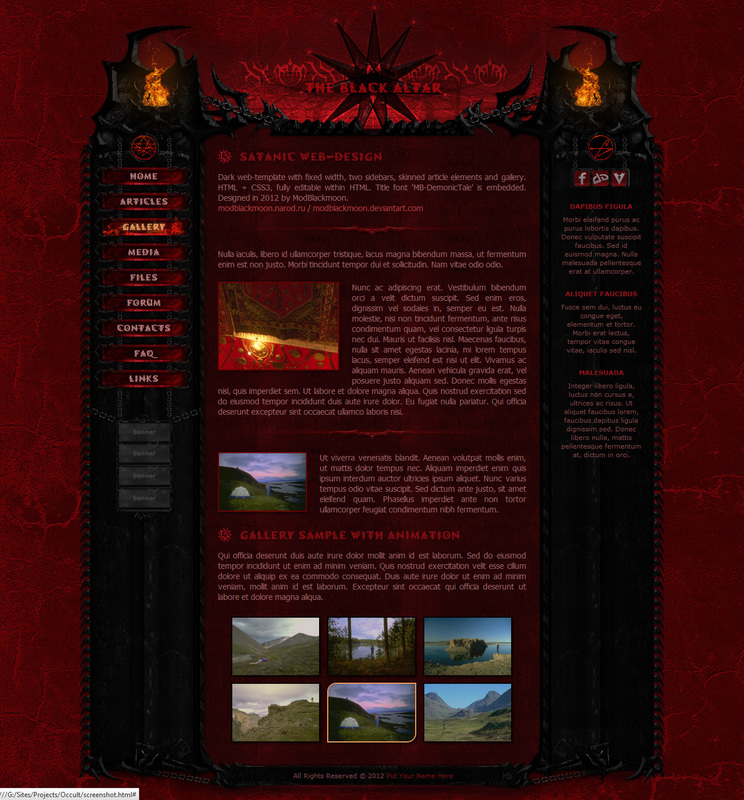 Header with abstract designs, game character [Game: God of War / Sony] and rss, email, faq buttons with mouseover effects. Fixed Width: 1000 pix. 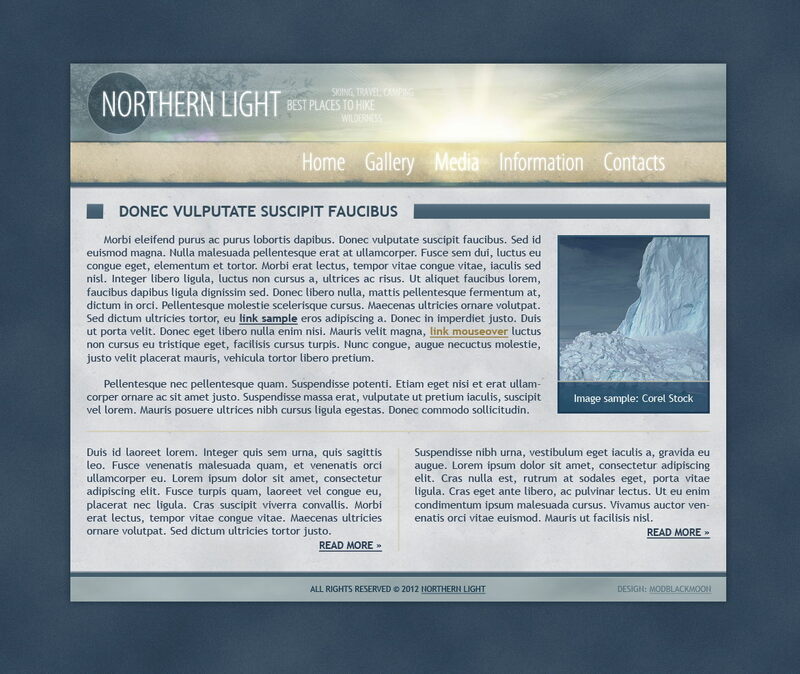 Very simple soft grey and blue Commercial Web-Template created for service company. Two columns. Menu buttons with highlight on mouseover is at the top. Logo design is mine too. 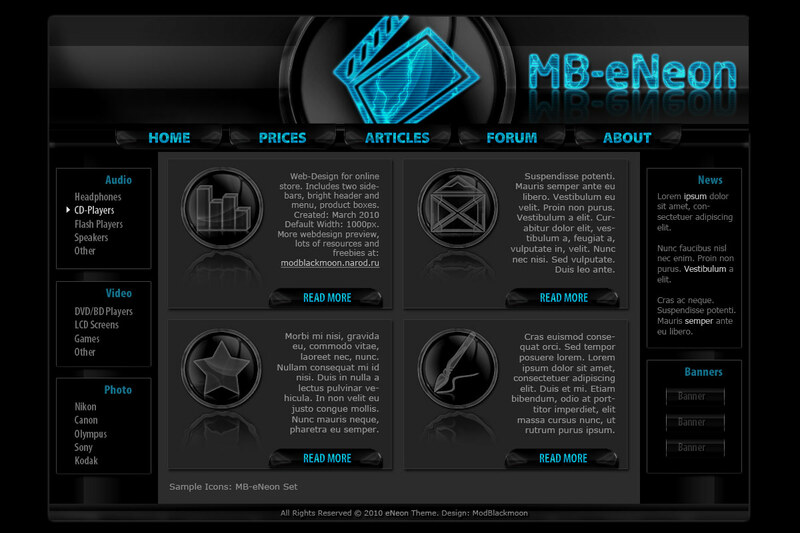 Header CD package image from MB-AesTeK iconset. Fixed Width: 960 pix. 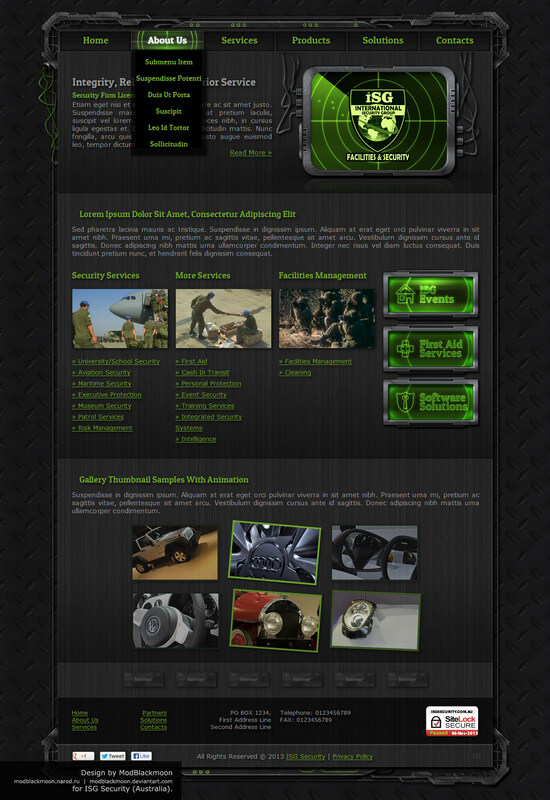 Tech Grey and Green Commercial Web-Template created for web-store. Two columns with Menu buttons at left sidebar. 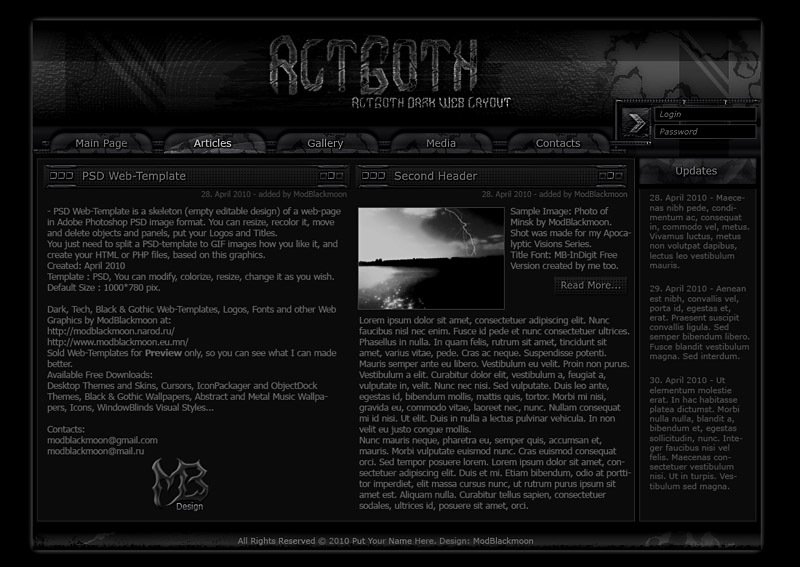 Header with search panel, rss and site title. Footer is almost invisible. Products gallery at the bottom of the content column. Fixed Width: 1000 pix. 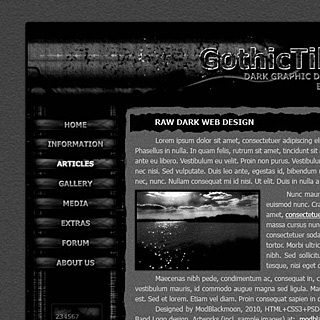 Dark Black and Grey Gothic Web-Template with Grunge elements. 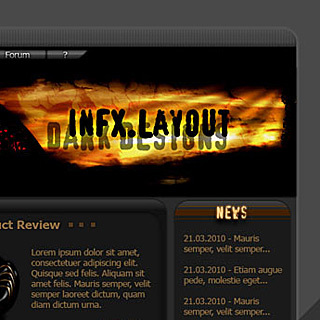 2 Columns, Header with some user panels and horizontal navigation buttons with mouseover effects. Width: 1000 pix. The whole thing was made for my good friend by special request. 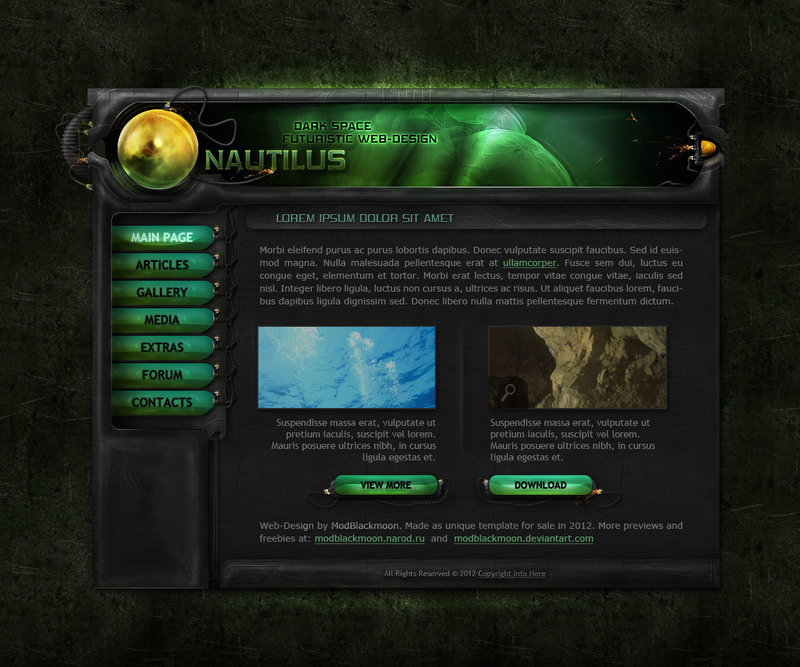 Hi-Tech dark blue Game Portal web-site Template with vertical button navigation and horizontal text navigation, Sidebars with futuristic elements and wires. Logo design is mine as well. Header Characters: Batman, Assassin's Creed, Half-Life. Date: March 2010. Fantasy, abstract purple design with magic lines and twirls. Fixed Width: 960 px. Dark aqua green style with abstract header. 2 Columns and horizontal menu with mouseover. Width: 1000 pix. 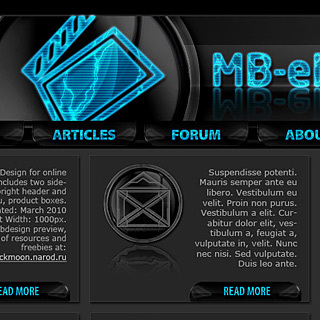 Sample Icons on this preview are from my MB-XIII Gothic Icon Set. 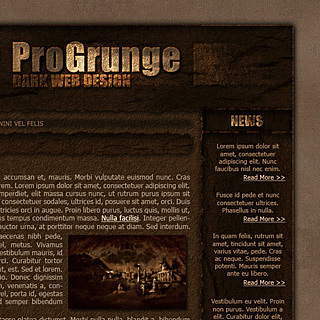 Dark grey Web-Template with bright grunge elements in header and section titles. 3 Columns with section boxes and drop down menu at the top of the layout. Width: 1000 pix. Green bright and positive design for gardening service website. Fixed Width: 1000 px. 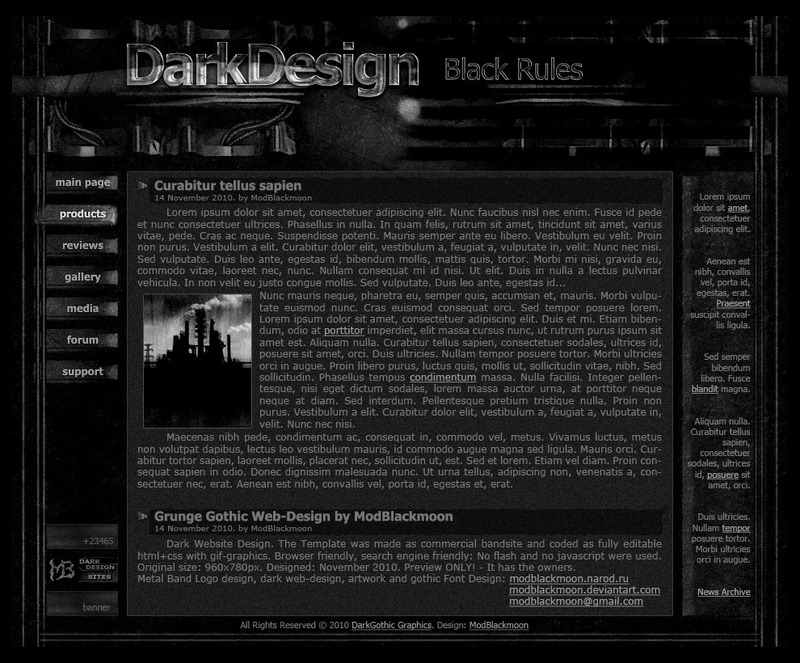 Dark grey glossy website design. Fixed Width: 1000 px. 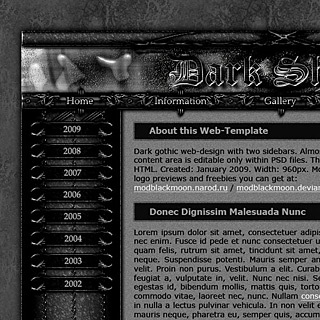 Another Dark Gothic Web-Template in grey stone colors. 3 Columns with panels and chains at sidebars. Light grey Header with silver title. Vertical Menu and Language panel. 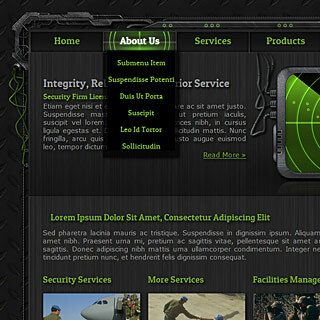 Dark Green Glossy Web-Template with bright elements. 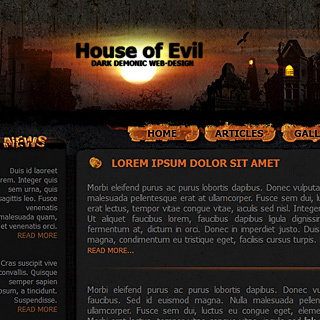 2 Columns, Header with glossy liquid title, horizontal dropdown menu with mouseover effects. Width: 1000 pix. 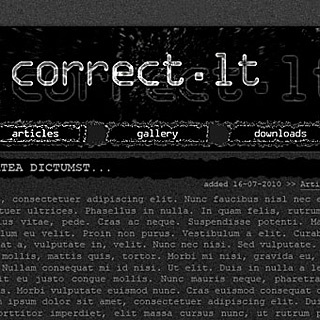 Noisy industrial dark web design. Vertical short menu and no sidebars, additional text menu at the bottom above the footer. Designed for pretty much small 10 pages site. Fixed Width: 960 pix. 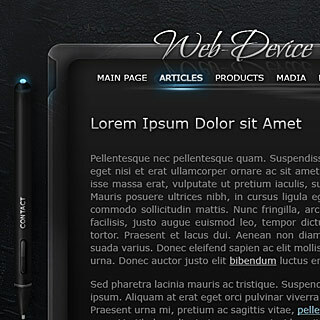 Dark blue glossy Web-Template glass elements. Vertical menu buttons with vista-style mouseover effects. Width: 1000 pix.